We often have Friday night stalemates called What To Watch On Movie Night. Having seen all the Harry Potters umpteen times, I’d been recommending the Star Wars movies, but the kids were mysteriously averse. The tipping point arrived along with the advanced publicity for VII, and our friend Sam lent the kids his entire collection of DVDs, and now…well, now I am sorry I pushed the issue. Within the space of five days, both kids became Star Wars-obsessed, and I remembered why I only watched those movies once, and the last of the prequels not at all. Over time, those movies do not hold up as the profound works of genius lauded by Joseph Campbell. I am certain I will get push-back for saying this, but…they just aren’t that good. The acting is wooden; the plots are ridiculous, and the special effects, while state-of-the-art at the time, just don’t hold up. And even though I admire Carrie Fisher (as a writer, as an actor, as something of a feminist activist), I find it baffling that anyone could tout the old Star Wars as having any feminist cred. The Empire Strikes Back, to my mind, is all about Han Solo sexually harassing her for the entire movie, and then it ends with her saying, “I’m in love with you.” And he says, “I know,” in this smug, jerky way, before becoming carbonized. ARGH!! (Sorry for spoilers, for those of you living in even more of a yurt than I do). But the movie came out in 1980, so I suppose we need to take that into account. We’ve come a long way, baby, and all that. Now she’s General Leia. That, at least, rocks. But over the holiday break, we did go see the new movie, and I mostly liked it better than any of the previous six. (Since we are still in the State-of-the-Art of 2015/16, I totally enjoyed the special effects, though I wondered if we would see through them in 30 years as we do those of the originals now). Watching that movie with my kids in the middle of the winter vacation in freezing cold Lake Placid’s lovely old-fashioned Palace Theatre will go down as one of the great memories. It was just so much fun to experience this new chapter with them, in the midst of their highly kindled interest. I’d venture to say the new hero of the movie does a lot more for girl power than 1980s Princess Leia did. Plus we all sang Bill Murray’s lounge singer version of “Star Wars, nothing but Star Wars” with the other patrons in the theatre before the film commenced. It was a satisfying community experience. Later that week, Tom and I watched The Martian on my computer, while the kids watched A New Hope for the second or third time. The Martian is my kind of space flick. And even though I consider myself a religious person, and I certainly believe in The Force, I vastly preferred the spirituality of The Martian, with its humanist emphasis on hard-won intelligence and loyalty, to the very strange supernatural telekinesis of the Star Wars characters. The simple miracle of a potato plant is all I need to carry forward my faith. But then, I got to thinking: is the vision of humankind Star Wars portrays actually more honest than the vision The Martian portrays? Let’s take a look! 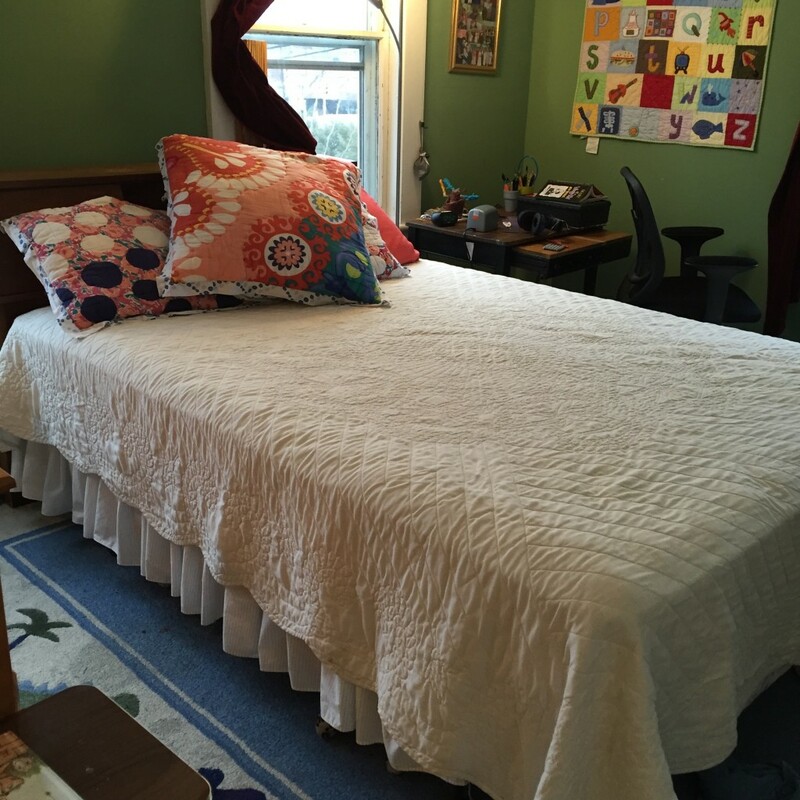 Over the vacation, my kids swapped bedrooms. This involved unpacking Lila’s Christmas present–– a trundle bed given to her jointly by her parents and grandparents which arrived in multiple boxes (including tiny boxes which purported to contain twin size mattresses. I was so convinced that this was impossible, I told the company we hadn’t yet received the mattresses, so we ended up with extra small boxes and more mattresses than we needed). What the grandparents didn’t know was that this would lead to Johnny ditching the queen-sized extra firm Sealy mattress and box spring which had belonged to Tom’s mother and has been their ultra comfy guest bed for the past six years, in favor of Lila’s old double loft bed, which has a futon on the top bunk and a horrible desiccated full set on the bottom. Loft Bed. 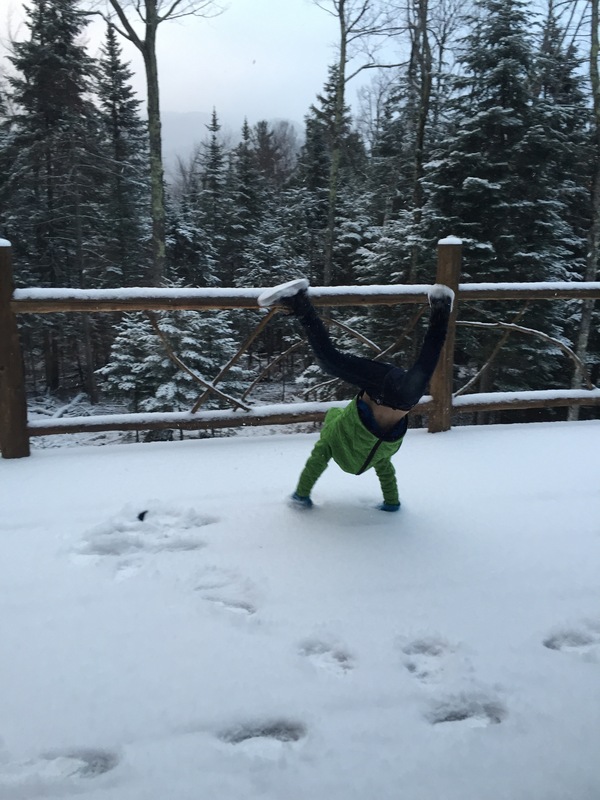 If you look carefully, you will see the graffiti of a 5 year-old on the wood. Can I really tell my parents that they will have to sleep here???? In a way, this is good. I love this bed. Tom built it for the kids years ago, and I’d imagined them having slumber parties there all the way through college. So I am glad Johnny is keeping it. But. Where will my poor parents sleep when they come here? As the Brits say, “There is no room in our house for the queen now.”* We have a third floor attic room, but the stairwell to it is windy and narrow–bad for guests trying to navigate; impossible for movers to move anything bigger than an a/c unit up and down. Then I had the thought that we could throw out the desiccated mattresses and somehow squeeze the queen into the spot under the loft bed, and I was so convinced that this could work that I made Tom measure it three times. The space is 75″ by 54″. The queen is 80″ by 60.” I almost made us both break our backs trying to wedge it in. This is how stubborn I am. And I had the thought, “If Mark Watley could fly through space by propelling himself with the air leakage from his space suit, surely we can fit a queen mattress into a full-sized frame!” But no, said Tom, shaking the tape measure at me. And then, I was so determined to get something for this mattress we inherited for free, I turned down perfectly good offers from people who wanted to take it from me. And now we are stuck with it, wedged vertically in Lila’s tiny room. We are going to end up breaking our backs to tie it to the roof of our van and haul it to the dump. My mother-in-law’s queen. Very comfy. My parents love it. In order to get it to the third floor, we’d have to spend $100,000 on an egress to the attic. PS We do not have $100,000. Why do I cling to stuff like this? I really thought, in the moment, that it would make more sense to keep an $800 bed and spend $100G to make it work in our house than to just give it away. In any case, it got me to rethink my Star Wars vs The Martian theological analysis. There’s a moment in at least two of the Star Wars movies (possibly in all of them, I’m really not sure) where someone presses a button and an entire planet explodes. And as I thought about my insane, greedy clinging to the mattress, it felt tragic and true. We humans have the potential to get so angry we’d blow up a world. Haven’t you felt that way sometimes? (Am I the only one?) In The Martian, there are no errors of this kind; there are intellectual errors, but there are no moments when we see human greed or evil or selfishness block the path of the miracle they pull off. (Correct me if I have misread something here. I only saw it once; but I bought the film and would love to have an excuse to watch it again.) There is even a moment when the head guy at NASA says something like, “If everything goes exactly perfectly, we can pull this off…” (Or maybe Mark Watley says this). And everything does, in part because everyone behaves so well. I’m glad they do. But that is not usually the case, at least not in my house, and we are actually pretty nice, reasonable, generous people much of the time. So I looked back at the clear good/evil dialectic in the Star Wars universe. The one thing I liked about the George Lucas films (as opposed to the new one, which had little input from him) was the transformation over time of Darth Vader. (SPOILERS COMING!!!) I really liked how he went from bad to good (to bad, although again, I didn’t see the last 2 prequels). And I have to admit, I liked that the Force was something both transcendent and imminent at the same time. It pulls the thread through the needle, even when things look hopeless. In The Martian, even though there is a really lovely moment of irreverent faith (the awesome use of Martinez’s crucifix) the whole movie really is a celebration of human endeavor. Yes, there’s luck, and maybe that’s all the same thing, or maybe it’s just Hollywood–most if not all action films pretty much end the same way, with heroines and heroes overcoming crazy odds to survive; but the luck doesn’t seem as Force-y as the spoon-bending variety in Star Wars. It’s just good science. But what of the power of human emotions? I mean the hard ones. The crazy ones, such as I evince on a regular basis. My hernia-inducing greed over the bed that causes me to hang on to something I really don’t need, that someone else can truly use (I tell myself, though, that I will need it someday, maybe, and that I will be really sorry if, when I do need it, it isn’t there). I need a power that’s both imminent and transcendent. I ended up compromising. I got the two young, strong dudes who are patching our plaster walls to lug the mattress up to the attic, where it is now sitting in the middle of the office. 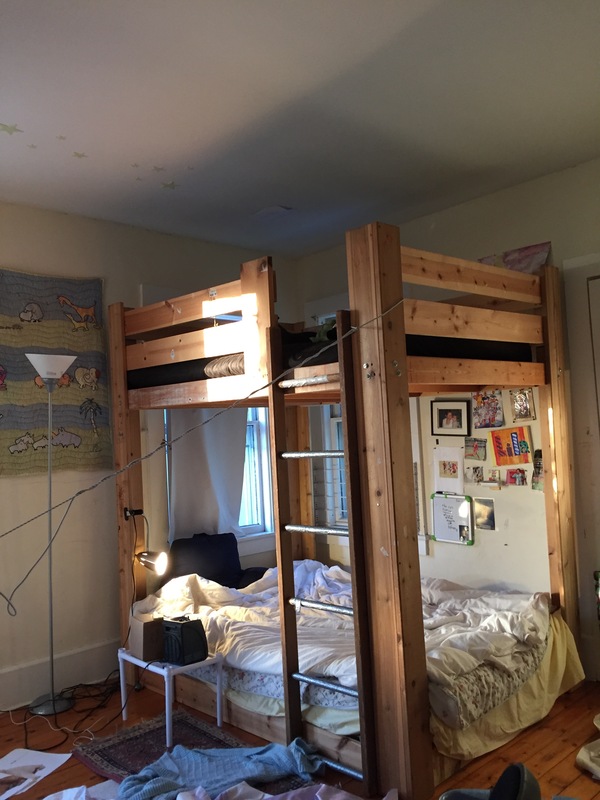 One day, I will buy a split box spring and find some other young people to lug it up, and then there will be a bed up there, and I will have a guest room at last. But I gave away the box spring and headboard to someone who can use it. And as they took it away, I breathed a sigh of relief and gratitude and thought of Mark Watley, shedding baggage to take off into space, hurling himself towards his friends, hurling himself toward connection at last. *OK, no Brits probably say that, but perhaps they should. I think you meant “transcendent and immanent … immanent and transcendent.” “Imminent” and “immanent” are different. So, Nerissa Nields, appropo of nothing here, what do you think of Obama now? You once called him a ‘transformational figure,’ I believe. For that matter, what do you think of Hillary Clinton, a notable war criminal now running for president? I am not right wing; if anything, I am way, way, way, way left of left. I hate war, especially the ones we keep starting or escalating that result in other countries being destroyed How many will that have to be? But then, there may be another world war coming soon anyway. and that will be the end of it. As someone called the Resident said on RT news, if you want to stop the violence, Obama, stop being violent. I think that apllies to all of us. And now allow me to say you are great and you and Katryna even greater. 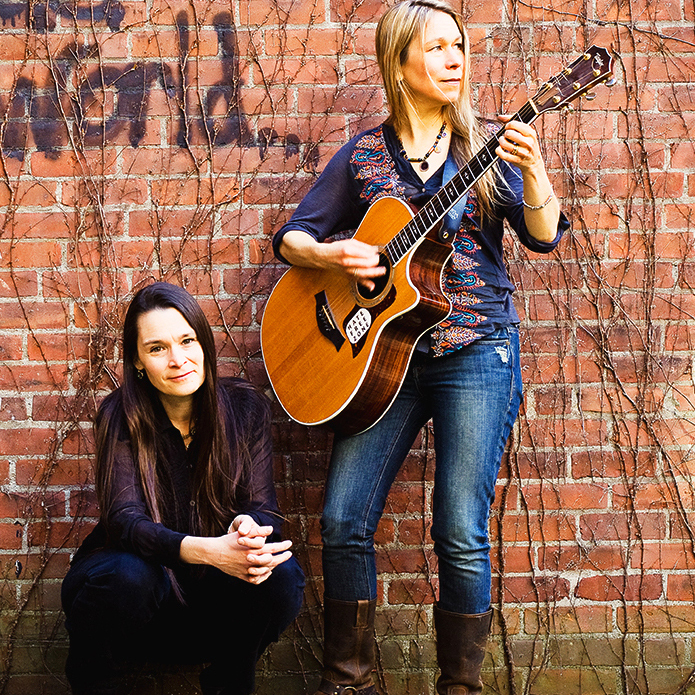 Looking back to the 1990s, behind only the biggest mistake I made in m life, my greatest regret of that era is taking to the end of 1999 to realize what a marvel the Nields were and thus missing that special time when you all were the next big thing. God, I wish I had been there for that. As it was, I only saw you and Katryna perform twice, which is exactly twice as many times as I’ve seen anyone else. I have never heard anything as sweet as your voices and harmonies, and to boot you are one of my three favorite songwriters. Oh, my gosh, do you realize what stars you and Katryna are, even if you never made a huge splash or had a mainstream hit? And you both have great hair and are photogenic to boot. You have tens of thousands of fans, I am sure, who will always remember and cherish you. Even if it was only one, say me, that would be something. As someone once sang, one is better than none. Yeah, that was you. It is Saturday Night Live’s loss that they never had you perform. On a personal note, I recently have taken to smoking 2-3 cigarettes a day for the first time in my life, though not every day. I know it is an unhealthy, not to mention expensive habit, but since I am fifty-one I figure effects won’t come until I am eighty. Anyway, I am betting if anything I’ll get cancer first from having eaten too many hot dogs. Obviously, I would love a reply, as it would be immensely flattering to me and why I wrote this missive. But even if not, I will always be eternally grateful to you, Katryna, and the rest of the Nields for being a blessing in my life. That being said, if I do not get a reply within 48-96 hours, my plan is to drop a Twitter bomb on your hashtag account politely directing you here, and I don’t even know what that means yet.